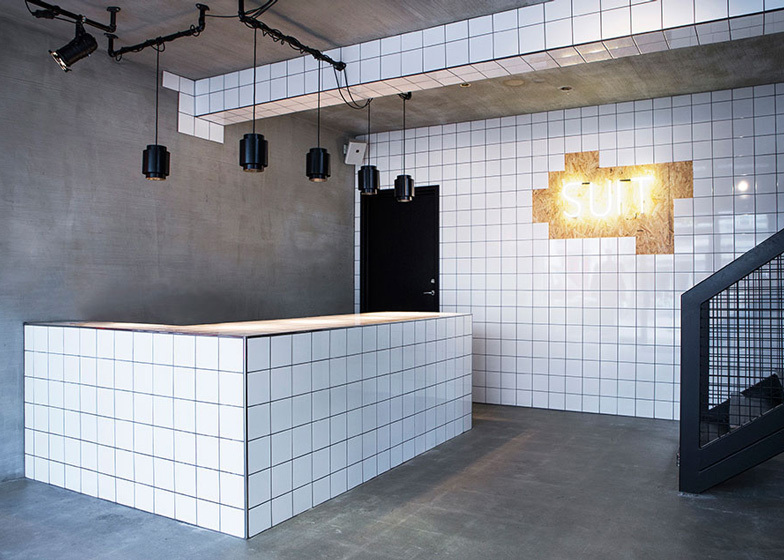 White ceramic tiles contrast with sections of chipboard inside this Reykjavik fashion boutique by local design office HAF Studio (+ slideshow). 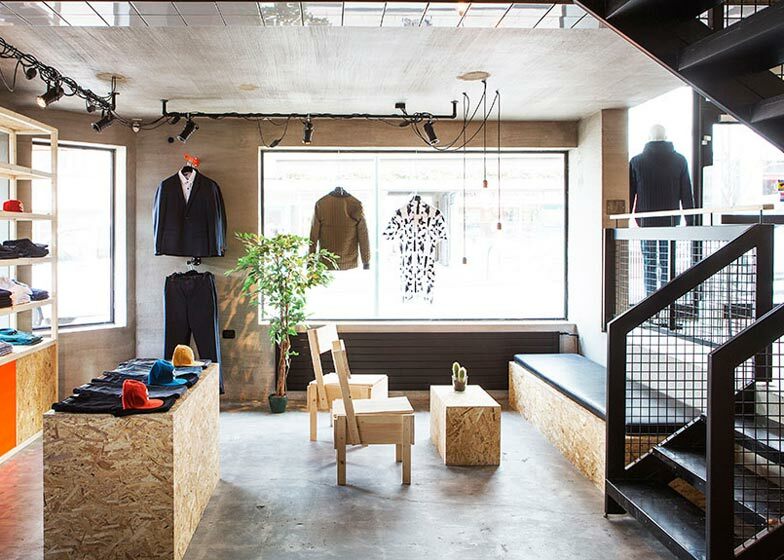 Icelandic designers Hafsteinn Júlíusson and Karitas Sveinsdóttir of HAF Studio fitted out the four-storey shop interior for Danish clothing label SUIT. 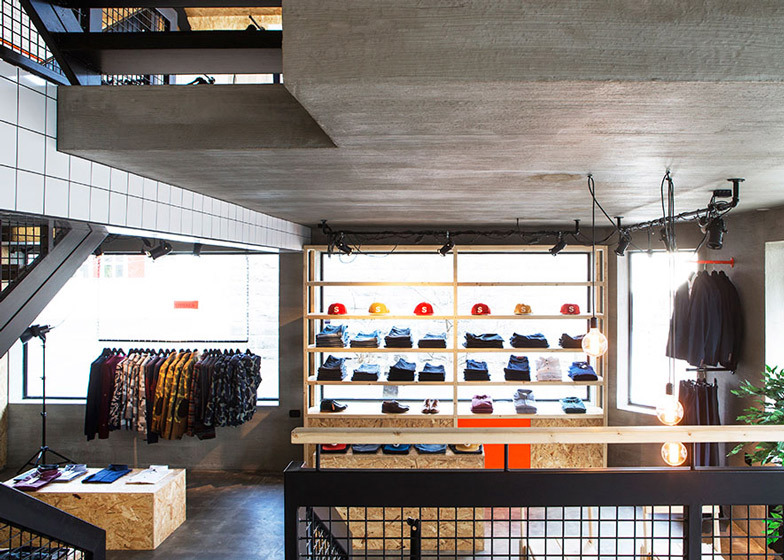 Located on a popular shopping street, the store sells a range of mens' and women's clothing. 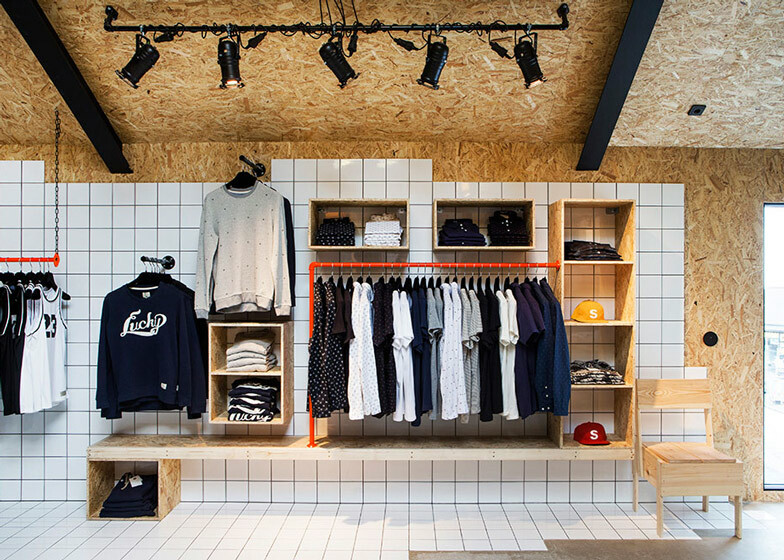 Designer Hafsteinn Júlíusson said the glossy white tiles were chosen to create a contrast with the oriented strand board – a kind of engineered wood that was used for walls and joinery throughout the boutique. "We wanted to add a bit of an unexpected twist," Júlíusson told Dezeen. "We think these tiles enhance the refined roughness that we were aiming for." The tiles create geometric grids across parts of the wooden walls, but also extend down to cover sections of the concrete floor. "More known for serving slaughterhouses or swimming pools, the tiles give a good contrast against the warm wood and the raw concrete," added Júlíusson. 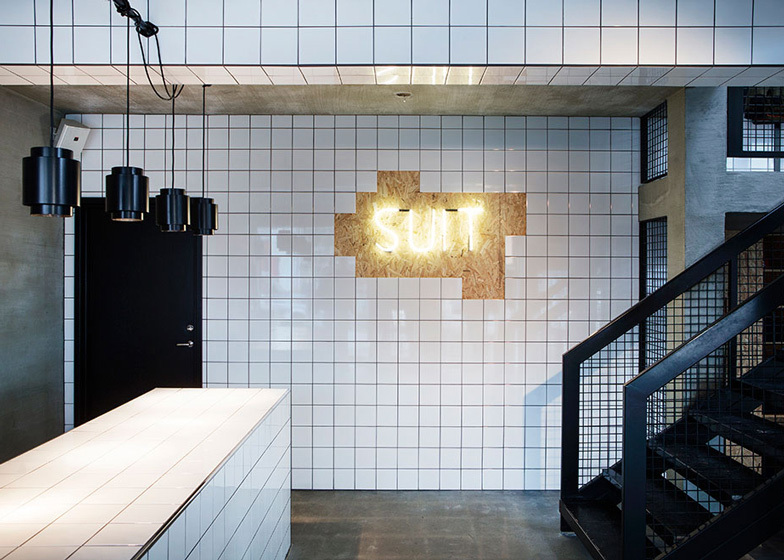 On the ground floor, strips of fluorescent lighting spell out the word 'suit', next to a tiled serving counter with low-hanging black pendant lamps, also designed by the studio. 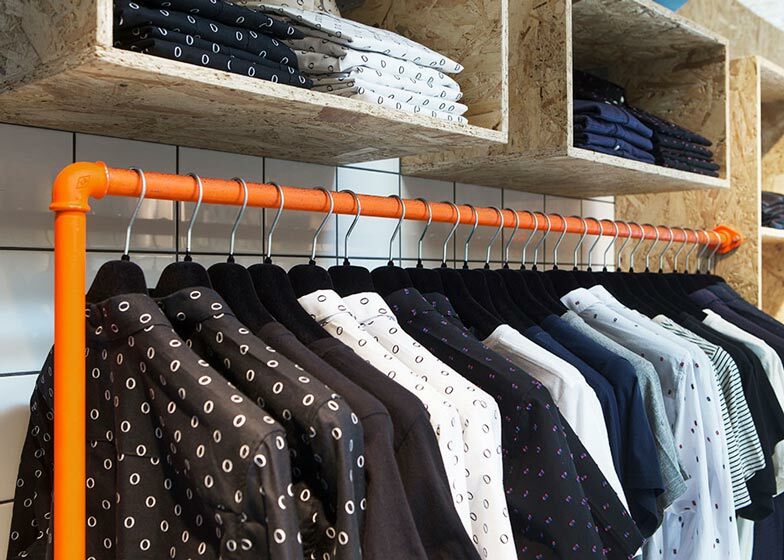 Shelving units are mounted to the walls to display folded clothes, while other garments are piled up on benches or hung from orange clothing racks. Cheeky phrases are printed onto the walls of the shop to help visitors find their way around – the words "Do you fit in?" highlight the entrance to the fitting rooms. Photography is by Gunnar Sverrisson. 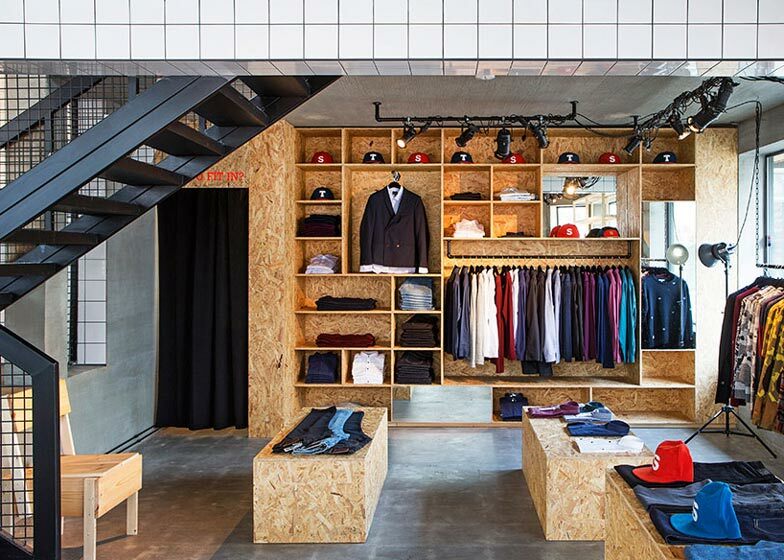 The clothing brand SUIT opened downtown Reykjavík recently. 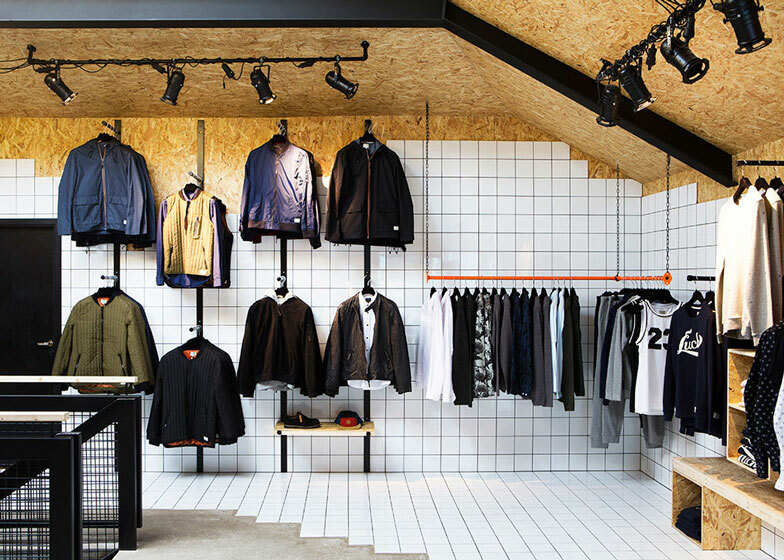 The store was designed by HAF Studio which is an Icelandic interdisciplinary design studio run by designers Karitas Sveinsdóttir and Hafsteinn Júlíusson. The design intention behind the new store was to tie the brand's raw and rough character together with clever and elaborate detailing. 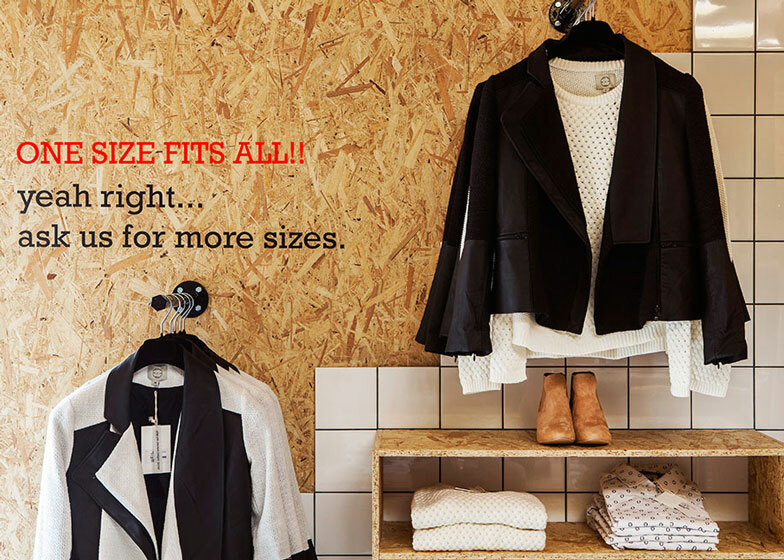 With this in mind, the HAF team created a space that offers a unique customer experience beyond that of the conventional clothing store environment. 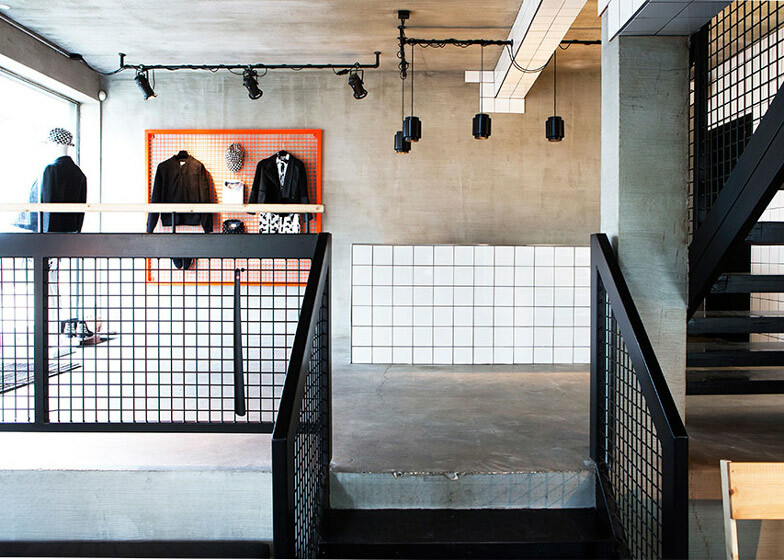 The raw concrete floors and walls meet a warm OSB wood cladding where white glossy ceramic tiles give the store a refined finish. Finally orange and black fluorescent details create contrasts and highlights together with crisp lighting.